When it comes to creating a calm, clutter-free home, it’s fair to say that not all rooms are equal. As a professional organiser (atidymind.co.uk), I am often asked to work on one room at a time and a different approach and mindset is required for each. It can be a blessing in disguise if you don’t have one of these. They are well known to be clutter magnets and the obvious place to keep “just in case” items or things that you avoid making a decision over. You might not feel like it, but these rooms are the best place to start – they contain the most storage space, so it makes sense to clear them out before you begin the rest of the house. Ensure the garage can fulfil its core function – to lock away a car. Consider wall storage for tools/garden equipment and use shelves with containers for smaller items, utilising the height of the space whilst keeping the floor clear. Consider the accessibility of a loft space and resist the need to overfill it. Protect paperwork and clothes by containing in plastic, airtight containers and label clearly (on all sides of each box) to ensure easy retrieval. Often overlooked, a bathroom is a vital part of a home. It’s where you get ready to face the world in the morning and where you wash away the day and wind down in the evening. The bathroom is manageable so you can make an impact quickly, which will encourage you to keep going. Toss any empty toiletries or those you don’t like or don’t suit you. Remember that liquid make-up only lasts six months and other toiletries and make-up, a year. Resist the urge to buy in bulk – I don’t believe the saving is worth the loss of space. The odd two-for-one deal aside, none of us are very far from a shop where we can replenish our stock. Use open containers to separate items under-the-sink drawers and consider attractive glass storage for items on show. Don’t forget to utilise wall space e.g. by fixing shelving above the toilet, wall racks for towels or wall mounting sower storage by suction or adhesive. Accept that the decluttering process will have to be repeated weekly – it’s a high usage area. The kitchen should be social and welcoming but it’s a multi-function environment – cooking, eating, entertaining, laundry, work, study, crafts and general hanging out may take place here. All tend to create disorder so it’s important to keep on top of this high traffic area and make it easy to clean. Keep counter space clear enough to make food preparation easy, only allowing daily used items and appliances to live there. Ask yourself whether you can cull some crockery and cutlery. Question whether you own multiple items which do the same job and declutter the duplicates. Do you really need a “junk drawer”? Find a place to home every little thing instead. Inside cupboards, consider stepped storage or turntables to utilise the whole space, move the height of the shelving if required and utilise other clever solutions such as tension rods between which to place flat trays. Organisational systems can really come into play in a kitchen too. Keep a dry erase board in there as a way to note shopping list items and move older food to the front of the cupboards and fridge before you unpack new shopping. It’s common for the bedroom to become a dumping ground for laundry, unpacked bags and miscellaneous items. It’s generally a not a place house visitors see so it may be the last place you tidy and declutter. But in fact, it’s the last place you should let clutter accumulate. It should be a peaceful retreat. Its functions are simple – sleep and relaxation and the number of possessions stored there should be low in volume. Go through your clothes and be ruthless about what you don’t wear. Most people wear 80% of our clothes 20% of the time but too much clothes clutter can result in ‘decision fatigue’ every time you open the wardrobe. Box up or vacuum pack ‘out of season’ clothes and accessories and find a home for them on top of the wardrobe or under the bed. If you’re not going to use something for months, there is no point in it being in circulation. Get into the good habits such as putting clothes away each night and laying out the next day’s clothes. It can make a huge difference to how you start the day in the morning. Bed side tables often have built in drawers which are a useful double function but don’t overfill them – hidden clutter can still impact on wellbeing. Invest in decent ben linen and furnishings to give your bedroom a luxury feel but ensure your bed is simple to make – too many cushions or throws mean they will likely end up on the floor. This room may need to adapt to the needs of multiple family members. The adage ‘a place for everything and everything in its place’ applies here more than anywhere. Firstly, ensure the furniture fits the size of the room – too large and it creates a crowded feel. Look for furniture with built in storage such as coffee tables with drawers and ottoman foot stools. If children’s toys are stored here, cubby hole units tend to work well as they can be filled with plastic or wicker boxes in which to store everything out of sight at the end of the day. Using boxes and bins to gather TV remotes and video game controllers gives them a “home” when not in use. 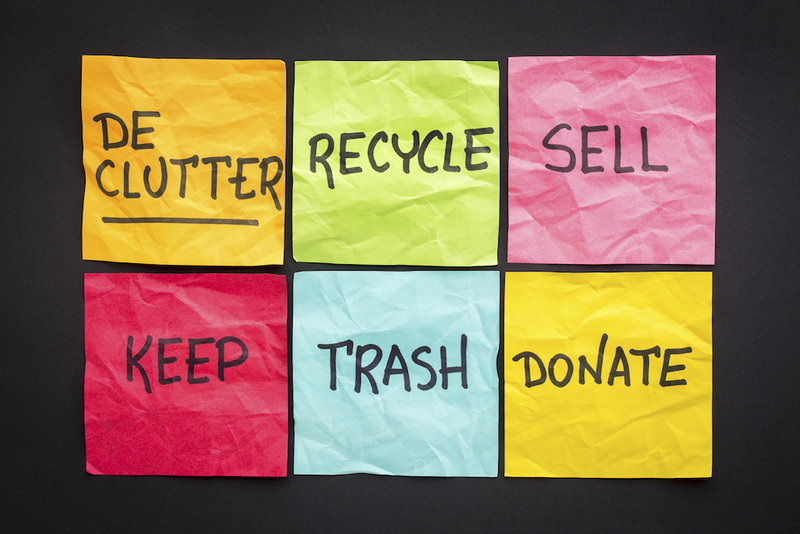 Create a daily routine of clearing out old magazines/newspapers and putting away items which don’t belong there.